from Fiesta at Rick’s: Fabulous Food for Great Times with Friends, pp. 276-280. I’ve been home from New Orleans for a month now. What with the rich food I ate there and the hot weather here, I haven’t much been in the mood to cook. Last night, I made up for it. Rick Bayless’s new book has a recipe for paella cooked over a wood-fire. My pyromaniac nerve twitched the moment I saw the photos in his book. I summoned six of my friends together on a weekend night and we had a feast. However, Rick let me down a bit. I should have known better. The cooking times don’t work. Plus, I overestimated the number of mussels. But I’m getting ahead of myself. His recipe is intended to feed 30 heartily and 120 stingily. I am going to adapt his recipe to feed 8 people with leftovers. As usual, you will benefit from my mistakes. The paella pan: I bought an enamel-coated paella pan for 10 servings at The Spanish Table in Berkeley for a comfortable $34. A well-informed employee explained to me the differences between the various kinds of pan. The one I bought was a good quality low-maintenance pan. The enamel does not require seasoning like the carbon steel one does. I thought it worked very well. Now that I’ve used it, I am interested in finding other things to cook in it. The rice: The man at the store said to calculate 1/3 – 1/2 cup short-grain white rice (like arborio or better yet Catalan rice) per person. I think 1/3 cup of rice per person is ample. The plan: Organize, prep, organize. Set up a table by the fire. Carry out to it aluminum foil, a timer, tongs, a long grill spatula, salt, trivets. Prepare all the ingredients, except for the chicken, immediately after lighting the fire. I put everything in separate storage containers until I was ready to work at the fire. The fire: You need a base on which to place the paella pan. If you don’t have a base like this, go buy a bunch of fire bricks — enough to stack them in a circle four or five bricks high with airholes between them. You’ll build your fire within the circle. I know, I know: this is a commitment. Heat the oven to 375. Put the chicken thighs on a baking sheet and roast until mostly cooked through, about 30 minutes. Remove from oven, cover with foil, and put on the prep table outside by the fire. At the end of the 30 mins, go out and start the fire. Make it a good one. Then go inside immediately and get the following chopping done as soon as you can. Put the broth with crumbled saffron threads in a saucepan and heat until warm. Turn the heat off or keep on lowest flame. You’ll bring this outside to the prep table when the other ingredients have been cleaned and chopped. Set oven rack 6 inches from the broiler flame. Heat the broiler. Put the tomatoes, poblano chile, and red bell pepper on the baking sheet and broil, turning once, until they are charred on all sides. Remove from oven, put the peppers in a bag while you peel and chop the tomatoes. When you’ve chopped the tomatoes and put them in a container that you’ll take outside, peel and cut up the peppers. Add the cut-up peppers to the tomatoes. Chop the onion and garlic and place in container that you’ll take out to the fire. Chop parsley and store separately. Either sausages into 1/2-inch discs or break up into pieces. Put in a container to take outside. Measure out the olive oil and the rice. Clean the mussels, ripping or snipping off the gross little bits that hang outside the shell. Store in container with the shrimp, which should be peeled and deveined already. Now you’re ready to put it all together. 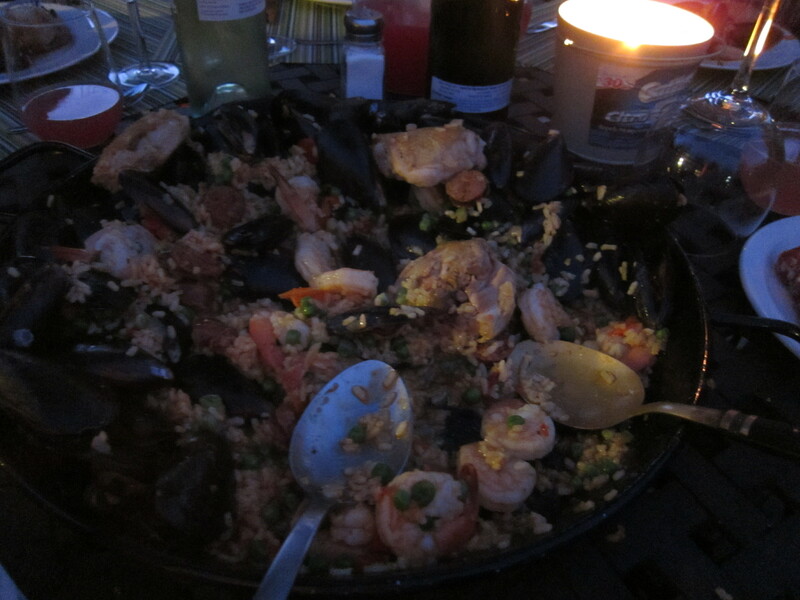 Get everything outside on a table within easy reach of the paella pan on the fire. Make sure the fire is hot and that you’ve got wood nearby to keep it hot. The way to adjust the heat is to use a poker to remove a log out from under the pan. Place the pan on the fire and pour in olive oil. Tilt pan to let the oil cover the entire surface of the pan. Place the chicken thighs in the pan, skin-side down, salt the chicken, and let saute for about 10 mins each side. Remove and put back in the container they were in. If there is still sufficient oil, don’t bother adding more. Add onions, garlic, and chorizo to the pan. Stir to make sure all of it will cook. In about 10 minutes, add the tomatoes and the peppers. Stir and cook until the oil separates from the tomatoes, about 7-8 minutes. Pour in the rice, stir up, and keep stirring so that it doesn’t stick to the bottom. When the rice has absorbed the oil and has become translucent, add most of the broth. Save some just in case it needs more moisture as it cooks. Stir thoroughly, assess the fire under the pan. And then don’t touch the rice for about 15 minutes. Adjust the fire, if need be. When the rice is almost soft, with still a little bite, quickly put the chicken, mussels, shrimp and peas in the rice. Bury the shrimp and mussels in the rice as close to the bottom as possible. If they sit on top, they won’t cook. Cover the pan with foil to trap the steam. 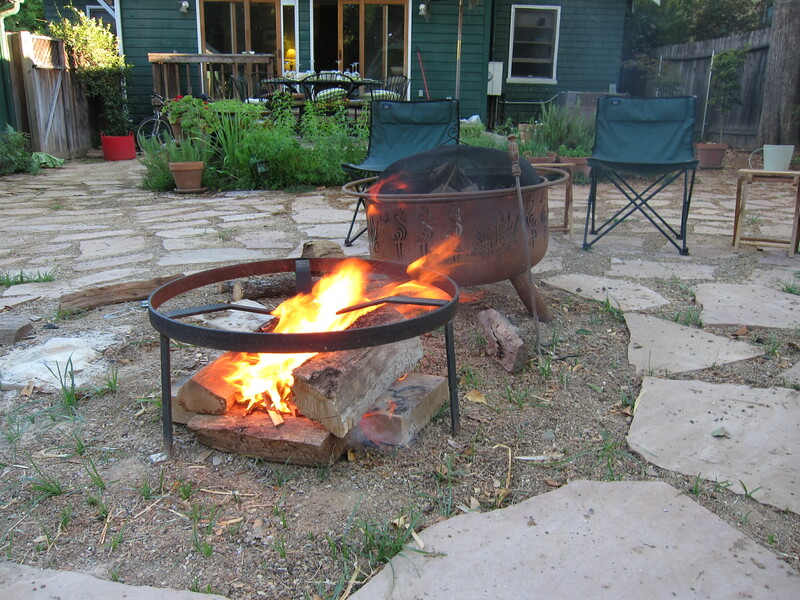 Remove the big logs underneath, but leave small pieces and embers. Push the burning pieces of wood and embers together so they form a hill. You want the pan to feel the heat but not enough to burn the rice. Let the rice stand covered in foil for 15 minutes. Test the rice and check whether the shrimp are cooked and the mussel shells open. If not, put one of the smoldering logs back under the pan for another few minutes. When the contents of the pan are cooked, you may sprinkle on the tequila. Get the pan to the table and tell your starving guests sit and eat. Then again, you could try all this with a small enamel paella pan on a gas grill. I may do that next time.